Love them! I am SO pleased with the way they look and I get so many compliments. Definitely recommend them! Ok so I have installed light fixtures before that were annoying. I read the reviews and thought I knew what I was getting myself into. I was wrong. This was not "rocket science " hard...but it was annoying. Let me explain. .. 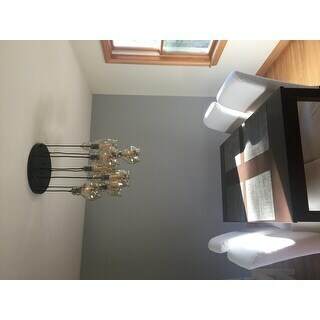 I read the reviews so I knew going into his I needed to make sure the plate was flush with the ceiling before adding the pendants to it. The box we had was small so I had to swap out screws which I had to rummage around to find...that has nothing to do with the light itself but I think even if my electrical box wasn't too small the screws provided are too long and you will have play around with it to get it right. 2nd - if you are a perfectionist or a symmetrical type decorator you'll get annoyed. You need someone to hold this thing on 2 horses or back to back chairs whIle you attempt to get each of these globes at a height yhat isn't going to make you crazy. If one is too high ate you going to be annoyed everyone you look at it? If so then you'll spend even more time getting these things right which is annoying. Mine aren't quite symmetrical and if I ever get the patience I will have to redo them. 3rd - revoewers who said don't take off the plastic until it is up are right. I'M these shoes be bubble wrapped because even a tin clink could cause your glove to cracking and ps this this s so heavy for one person to hold up while the other connects that you are bound to wiggle at some point. Personally I felt like I was dying holding this thing up while my husband connected the wires. My shoulders were vining and I was shaking at one point. We had 4 people doing this so I feel very foolish that this uncomplicated light was so complicated. It is pretty. So there is that. My advise...have 3 or more people. Make sure you have a ladder to set the light on so your arms don't fall off and take a zanax because this thing will test your ocd patience. I wouldn't put myself thru this again. I like the light but not enough to deal with the process again. Pardon me now...I must refresh my wine glass. I deserve it. 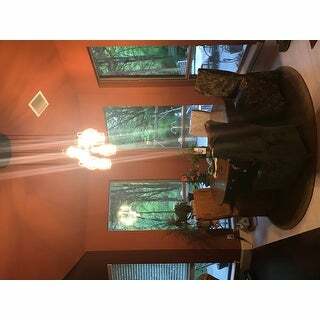 Great chandelier! I recommend having 2 people install the light fixture and not removing the wrapping on the glass until after its installed. I am laughing as I read some other reviews. I pretty much faced all those problems myself trying to get it installed. I am an experienced installer. However this was the most annoying installation. First the ceiling plate doesn't sit flush, you have to use some washers to make it tight. The pendant lengths needs to be adjusted several times until the height is right and the arrangement pleasant. The screws that tighten cord to the plate are too small. If you lose it you may not find it. The wire nut is too small for wiring 8 wires to one. Finally holding it up and hanging is a 2-3 person job. The pendants are so thin that if one touches the other it will crack. I suggest wrapping them up in bubble wrap before installing. It would have been much better if the globes were installed at the end. But no, they don't come off the cord. I actually feel bad to give a 3 star to such a beautiful chandelier. But if you crack one globe it'll be useless. Update: Bought another one. This time the globes came wrapped in Styrofoam webbing (the ones some exotic fruits come wrapped in). Installation was so much better this time. Last time it had a plastic shrink wrap only. Cracking was my biggest fear. Its a wow piece. But requires time to install. As discussed in previous reviews, the directions are inadequate. There is absolutely no guidance as to the length of the chords and arrangement for hanging the globes. That is left entirely up to you to figure out. I highly recommend trying to find someplace to hang the pendant before you attempt to attach it to the ceiling box. 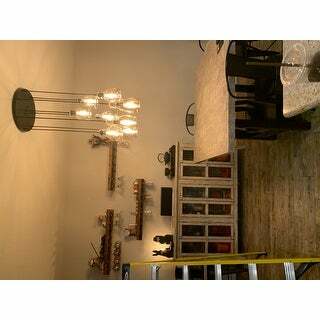 ( I used a hook in a low basement rafter and hung the entire chandelier up with a sturdy wire.) That way I could stand on the ground and adjust the heights and arrange the globes. Better to do this standing than on a ladder, because it will need adjustment. TIP: Whenever you hang celling fixtures it can be done more easily with one person if you use a sturdy piece of wire and an S hook to hang the fixture from the junction box. For example, hang your Pendant about 6 inches below the box w your hanging wire and S hook. With the weight off the fixture, you can easily use both hands to make the wiring connections to the junction box. Once wired, simply cut away your sturdy/hanging wire, lift your fixture into place, and secure it with the provided decorative nuts. Wasn't too difficult, Love this light! There were 3 of us and it took about an hour. Wasn't as bad as i expected. I would recommend having 2 larger wire nuts though because the ones that are included are tiny and won't fit all the wires in them. Cutting each cord was easy. I hung from a 9 foot ceiling. I didn't measure each cord, just kind of eyed them and it looks great. My longest one was around 34" to bottom of globe. Shortest was around 18". Just staggered the lengths on the others. 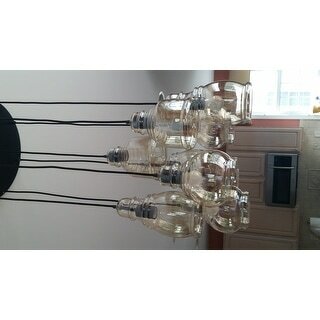 Removed the plastic after it was hung, then installed the Edison bulbs (not included). By the way home depot charges *** per bulb so i would recommend buying online cheaper. You will need 8 of them. I bought 60 watt but am returning them to get 100 watts. They just weren't as bright as i would like. I also installed this on a dimmer switch so if the 100 watts are too bright i can dim them. The glass globes are an amber color. Was glad they weren't clear! Base is black but almost looks like oil rubbed bronze. 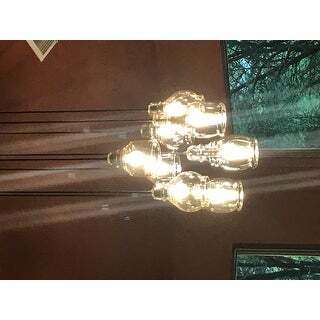 Love this light! The globes are beautiful, but hanging it was a job! And, it definitely takes two people. 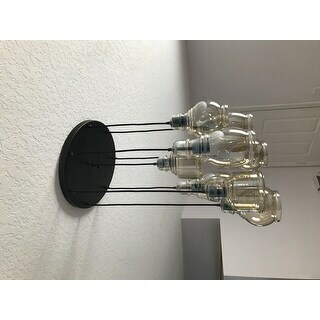 I will have to take it down because the plate does not sit flush with the ceiling and to adjust the globes length better. Not a lot of direction from the directions either. Thankfully, I read most comments so I had an idea of the concerns. 3 IMPORTANT TIPS: Leave the globes covered while securing (or risk clinging and/or breaking them), be sure to measure the mounting plate to the housing (may need to raise the housing to get flush to ceiling), and adjust the cords for each light BEFORE you hang it (trying to adjust the length of the lamps while hanging from the ceiling is difficult). Otherwise, it's a beautiful piece. 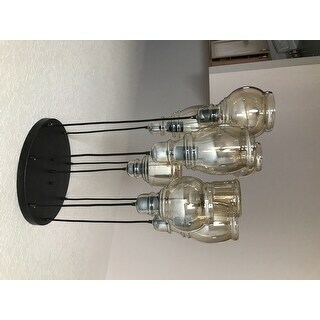 I've ordered some Edison pendent dimmable bulbs as well. I think it will be an amazing look once it's all together. Bought the square base for above the island, and round base for above the table. Installation was a little tricky because you have to decide your own corn lengths. First of all, this is a gorgeous light and looks absolutely beautiful! I was a little nervous about buying this because everyone spoke about the difficulty installing it. We came up with a brilliant solution that I wanted to share with the Overstock community. We have a very sturdy dining room table and a very lightweight daughter. She stood on the table and balanced the fixture on her head while my husband attached it to the ceiling. He had it up 1-2-3! It was a lot easier than the double and triple ladder/ people set up I expected it to take. 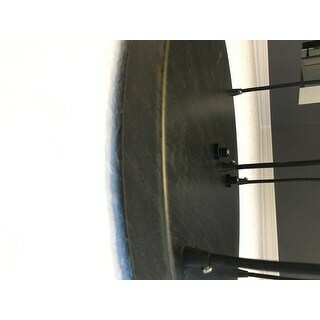 Only try this if you trust your table and have lightweight , motivated family members but it makes installation a breeze! This piece is so elegant, beautiful and unique! 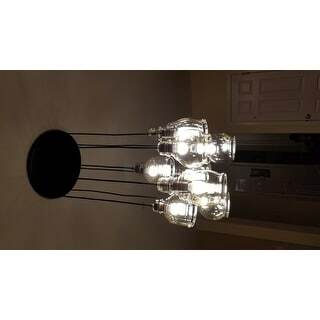 I have shopped around and nothing has compared to this light pendant fixture. I recieve this order less than a week to my home. Well, packaged. Ive had them for two weeks now and they where put up yesterday. You need atleast two people to put these up. Also when installing leave the protective coverings on until it is completly installed (so that the pendant glasses do not get damaged/broken). I just cannot stop looking over to my new fixture! Im am so happy with my purchase! LOVE, LOVE, LOVE! Love this lamp it adds character to my decor. The lamp has great possibilities it classy and goes well with my decor. Beautiful - delivery on time. Great light = love the amber lights. The way they hang makes a great statement. Lovely over a table. These lights were impossible to hang. We had three people trying to hang it and it’s really heavy. We wrapped the lights because they would hit each other while trying to hang the light. One light ended up breaking anyway. 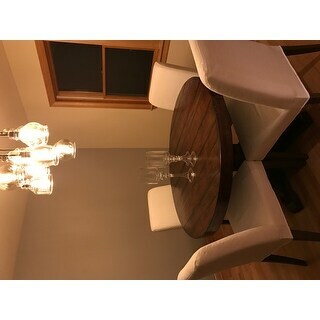 I regifted it and bought another fixture. The light is beautiful and everyone that comes over compliments it. Electrician shorten all the cords because they were to long for my set up and he mentioned that the directions and configurations are terrible. The glass is very delicate leave the protective foam on the glass while installing as others have mentioned. There were moments when I was needed to assist him but mostly a one person job. 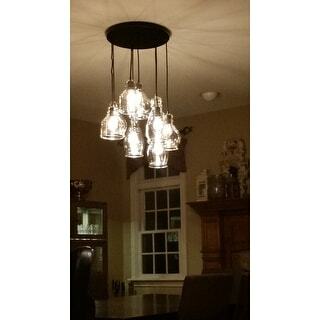 Absolutely stunning light fixture. We love it. I suggest you set it up between 2 ladders and a board to start so you can play with the lengths of the cords before mounting up on the ceiling. We hung this light in our kitchen and it is gorgeous. We followed the advice from other reviewers and hung the base between 2 tall stools to easily calculate and adjust the length of each cord. I definately recommend this fixture, it is a great value for the money. 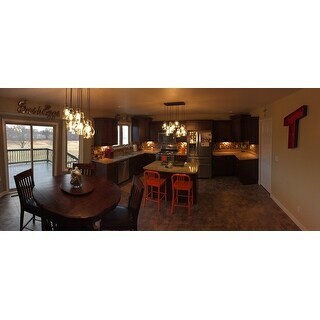 I love the light fixture. It is over my kitchen/breakfast table. I receive compliments on it often. The fixture with LEd lights makes a stricking appearance. 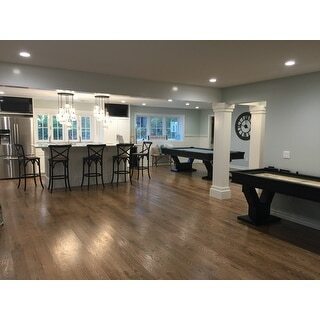 "Is this fixture good for a center hall with a ceiling of 14 feet? Will I get the answer in my email? 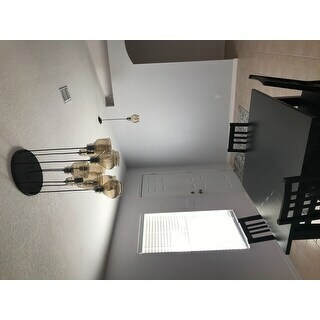 I have purchased with overstock before so my email is available "
14 feet ceiling is too high for this fixture, which will make the shortest pendant be hung above the floor around 10 feet. "Can this be hung on a slanted ceiling?" 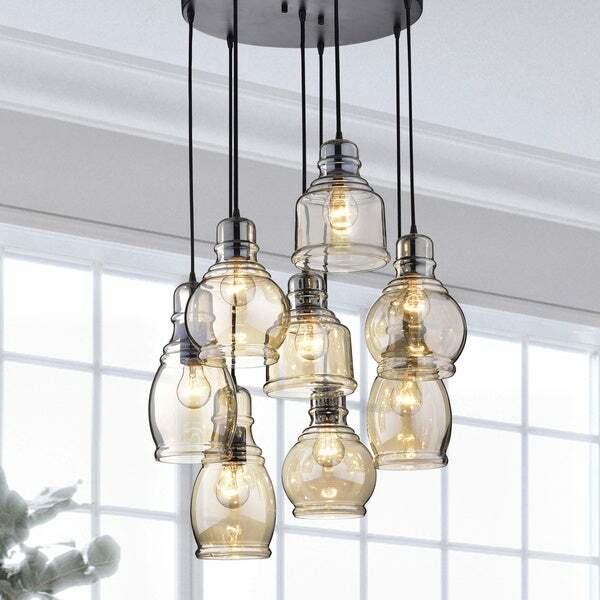 No, it can't be hung on a slanted ceiling as the pendants may swing into each other and break. "Does this come with the bulbs? AND where can I find 100w HALOGEN bulbs? I’ve looked everywhere to have some on hand. " Bulbs are not included. You can use 10-watt Edison style warm white LED bulbs to replace 100-watt halogen bulbs. 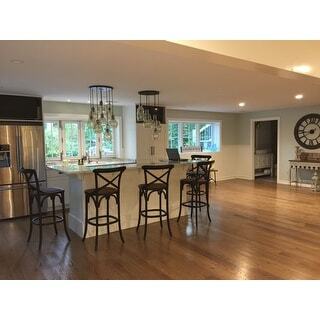 "I am replacing a fluorescent light above a kitchen island. Will the 3 pendant put off as much or more than the previous fluorescent? Or should I get 2 of them and place at either end? I will have the single pendant over the sink, adjacent to the island and the 8 pendant over the eat in kitchen pub table." If the length of the space of your kitchen island is more than 9.8 ft, hanging 2 of the 3-light versions is recommended. If the length of your space is less than 9.8 ft, we suggest you installing one 3-light pendant. "I see this light is ETL listed. Does that mean it is UL Certified?" It means that the light can be used in both the US and Canada. The product is safe. "can you use led light bulbs?" Yes, you can use LED light bulbs. Please note that the LED bulbs need to match with the E26 light sockets. If you install LED bulbs, a dimmer switch can not be used in this light. "How much does this fixture weigh"